Members discussed refreshments and roles for Cafe Night. For more information about Peace Club’s efforts in supporting the Flint Water Crisis and the Recycling Club, click here! At today’s meeting, members reflected on the Flint Action Day volunteering experience. To read more about Flint Action Day, click here. Members also updated the Peace Club bulletin to publicize Cafe Night. For more information on Cafe Night, click here. This weeks’ Valentine’s Day Lip Balm Sale will be cancelled. The sale will be postponed to a later date. More details about future dates for the lip balm sale will come soon. At today’s meeting, members took group picture for yearbook, updated the bulletin, planned out our Valentine’s Day Lip Balm Sale! Members signed up for days to sell lip balm. Thank you to all the members who will be able to sell lip balm! Sales will be going on during all three lunches from February 10th to February 11th. For more information about our Valentine’s Day Sale click here! Also, Peace Club has enough performers for the 10th Annual Cafe, so thanks to everyone who will be performing! In today’s meeting, we watched a few auditions for the 10th Annual Cafe Night. Due to the small number of auditions, we will continue to collect auditions, so make sure you fill out an audition room ASAP!! Please see Ms. Dobbs in room B-14 if you are interested in performing for the 10th Annual Cafe Night. Peace Club Members: You are required to buy a ticket for Cafe Night and learn the lyrics for the song linked above so we can all sing at the end. We also plan on selling natural lip balm on February 11th and 12th to celebrate Valentine’s Day. In today’s meeting, the two main topics discussed were the Cafe Night auditions and the Burundi crisis. To find details in regards to the 10th Annual Cafe Night and auditions click HERE. Peace Club members discussed the crisis happening in Burundi and talked about the importance of bringing awareness to the crisis. Ideas brainstormed to spread awareness included utilizing the Peace Club bulletin, signing petitions condemning media outlets for lack of the coverage of the crisis, and writing articles. Thank you to everyone who donated to help Syrian Refugees! Together, we raised over $400. At today’s meeting, members signed a letter that will be sent to Governor Rick Snyder expressing our concern on his opposition to Syrian refugees settling in Michigan. Members also talked about possible topics for awareness. Auditions will be taking place for the 10th Annual Cafe Night in January after winter break. For more information about Cafe Night, click here. The Peace Club Bulletin is finally updated to publicize the money donations to help Syrian Refugees! To learn more about Peace Club’s effort to assist Syrian Refugees, click here! In today’s meeting, the date for the 10th Annual Cafe was narrowed down for March 11th, 2016. 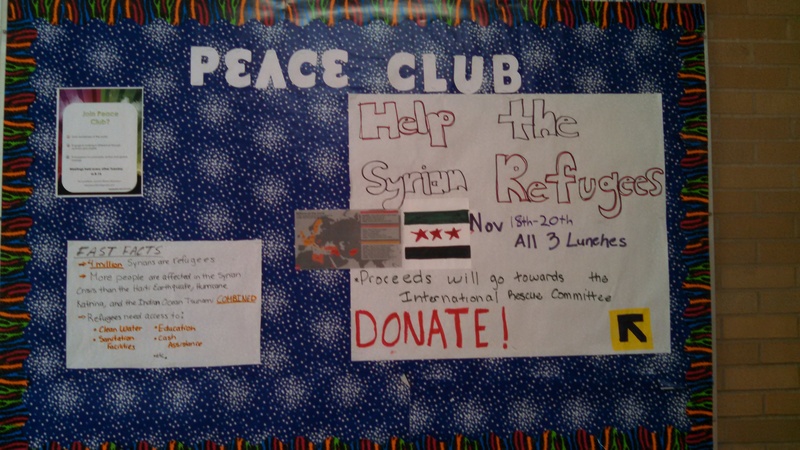 Throughout the month of November, Peace Club will be raising money to help Syrian refugees in the Middle East. Two organizations to fundraise for that were discussed were Global Giving and International Rescue Committee. An idea thought about was dedicating a section of the Peace Club bulletin to students who donate a certain amount of money towards the Syrian refugee crisis. A sign in sheet was passed around for members interested in collecting money during all three lunches. Peace Club will be collecting donations every Wednesday and Friday of November. Welcome to the official website for Dearborn High’s Peace Club! Promoting world peace through charity and dialogue for over a decade. Our 10th and final annual cafe night! Enter your email address to follow Peace Clu and receive notifications of new posts by email.